Navy knotted rope lace bracelet featuring silver-plated hardware and contrast emblems. Spreading more positivity, Rastaclat have utilised their mastery of shoelace to produce a bracelet of high-end quality and style. A brand all the way from Long Beach, USA, Rastaclat emphasises its foundation of skateboarding culture to spread waves of positivity. Totally rejecting the notion of 'mainstream', Rastaclat strive to present an indie look through unique products designed to encompass self assurance, confidence, and expression. Stand out and make your own path. Wear it loud, wear it proud! Rastaclat comes to the UK from Long Beach, California. Founded from the roots of the sneaker and skateboarding culture, Rastaclat believe in spreading positive vibrations in a world with so many negative occurrences and energies. 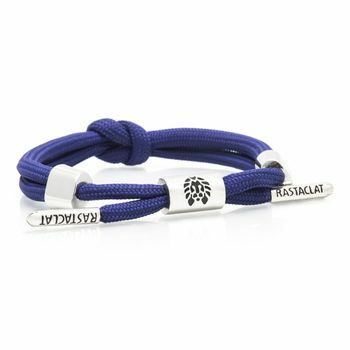 Rastaclat don’t utilize gimmicks to sell their product or hop on a bandwagon for social cause just because it is popular at the moment. What Rastaclat do guarantee is that the product will get you noticed, instilling confidence. Rastaclat strive for their brand and product to encourage style, and a sense of positivity and freedom of expression. Rastaclat are fortunate to have a unique product that nobody else has – that separates them. And spicystyles UK are proud to bring these great bracelets, belts and caps to the UK. Wear it loud, wear it proud!